Cruise along the Harbour with the the best New Years Eve boat hire Sydney, Eastcoast Sailing! The clock strikes midnight, it’s the most-awaited moment at every New Year’s Eve event, and simultaneously fireworks burst across the sky. People hug, kiss, and hold hands while they admire Sydney Harbour’s pyrotechnic spectacular! With a glass of bubbly in hand and a centre stage view of Sydney’s celebrations, you can experience the magic of Sydney’s New Years Eve. 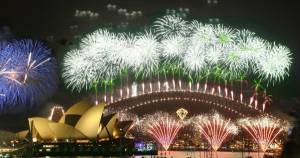 Sydney’s New Years Eve is one of largest and most popular free events in the world. As such, crowds build steadily from about midday. In fact, NYE Harbour Cruising is one topic that gets a huge amount of questions on the TripAdvisor Sydney forum. There are many great parks, foreshores, and venues on both sides of the Harbour to view the fireworks. However, it is important to know that the city is very crowded on NYE. Think road closures and busy public transport. Be prepared to spend the best part of the day in the sun waiting to get a good spot. At many viewing areas you can bring your own food, but most do not allow you to bring your drinks. Instead, many sell them at inflated prices inside some of the sites. The following 5 reasons are sure to convince you that New Years Eve Boat Hire is the way to go. Our luxury boat hire boasts all the luxuries of the most upscale hotels – more in many cases – and they’re yours to enjoy as you relish the beautiful views of the city’s skyline, the Harbour Bridge, Sydney Opera House, and the gorgeous Harbour. We have a fabulous selection of yachts, catamarans and motor boats available for New Years Eve boat hire in Sydney. For the entire duration of your journey, crew members will serve your every need, whether it’s a delicious evening cocktail or a platter of fruit for daytime snacking. Our boats cater for a range of guests for up to 35 guests on some catamarans. There are luxury options available with a huge deck space or dancing area and available BBQs, as well as all inclusive dinner cruises. By chartering a private boat, you can embark on a luxurious adventure with the people you cherish – and them alone. Why not be immersed in the best New Years Eve Boat Party Sydney? At Eastcoast Sailing you will capture breathtaking picture with the people you cherish. Rest assured; people will be taken back by your photos of both the 9pm and 12 pm fireworks, the perfect photo op! Our chartered yachts come with experienced and friendly skippers who love to tell people about the beauty and history of the stunning city of Sydney. Of course, they’ll leave you alone when you want to enjoy privacy with the family, but they’re always ready to assist when you have questions, requests, or just want a casual conversation with somebody who knows about the area. Convenience when it truly matters. A New Years Eve boat hire, whether you choose private boat charters or NYE Harbour Cruise ticketed functions, we take the stress away from hosting a function at your home or organising a night out on the town. There is no need to worry about finding a car park and you also avoid expensive parking fees and fines. Our vessels also have self catering food and beverage options, giving you flexibility and choice to create the evening of your dreams. Or if you prefer something bigger and all inclusive, we have some of the best function boats offering delicious on board catering, quality beer, wine and champagne flowing freely all night long. Live music, DJs and dancing of course! Join more than one million people gathered around Sydney Harbour to ring in the new year with one of the best new years eve boat hire in Sydney. Eastcoast Sailing is a high-class New Years Eve Boat Hire provider in Sydney, helping you throw an unforgettable New Years Eve Boat Party. Contact Us today to secure your private boat hire or tickets for New Years Eve 2018.